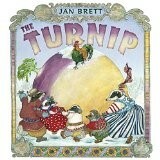 One tasty turnip turned out to be a problem in badger girl’s garden. It was a giant turnip. Such a giant turnip that not badger girl, badger brother, nor badger parents could get it out of the ground. Jan Brett once again beautifully illustrated a well-loved Russian folk tale and told it with a surprising new twist readers will love. Nothing is more fun than knowing something about a story the main characters don’t even know. This cumulative story told in the center of the pages is foreshadowed in the margins, as is Brett’s pattern. Young readers and listeners enjoy watching the story progress and develop from margin cameo to double page spread. In many instances, while children know who the new character is going to be, they can only guess at the upcoming action. Teachers and librarians can fulfill core curriculum standards in literacy, art, and geography as they introduce folk tales from around the world. Parents will enjoy including this beautiful new Brett book to the read aloud collection for quiet time.